When I began my reading journey five years ago, I thought I had no interest in Christian literature, and certainly not in Christian fiction or self-help gobbledygook. But in the last few years, I have developed a need and warmed up to reading biographies of early Church Fathers, histories of the Church, and testimonials of Christian faith and truth. Many of these books are pure encouragement, and I want to continue reading more like these in years to come. This book, The Greatest Sermons by Jonathan Edwards (1703-1758), a Puritan New England theologian, is a collection of his most urgent messages between 1725 through 1750. 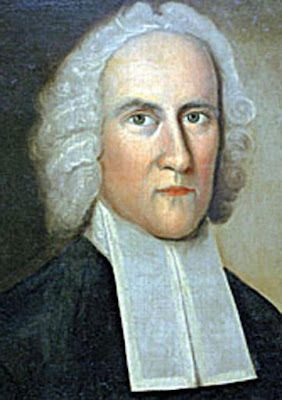 He was extremely popular during the Great Awakening (1730-40s), which he probably caused because of his preaching, or maybe it was just a time when New Englanders thirsted for the grave truth; either way, Edwards was instrumental in turning the hearts of the colonists back to God with the Bible's alarming warnings. His expository sermons were extracted directly from Scripture, aimed at the sinful hearts of men. He did not soften his delivery or sweeten his words; he defined it exactly as it was and is, according to the Bible: sin, hell, eternal punishment, damnation, election, repentance - whatever he was preaching. The Israelites (our example) were always in danger of falling into God's vengeance, but He preserved them for His appointed time. Edwards interprets Psalm 32:35 to say: There is nothing that keeps wicked men . . . out of hell, but the mere pleasure of God. Edwards demonstrates that God has the power to cast men into hell, they deserve to go to hell, and they are already under a sentence of condemnation. Man is the object of the same wrath of God that others are experiencing in hell right now; Satan will take them as his own the moment God will permit it; evil forces are reigning in the souls of wicked men; while death may seem far away, the unsaved are not safe; and the unsaved cannot escape hell. are in the hands of an angry God. There is no other reason that you were allowed to wake up this morning and did not go to hell last night after you closed your eyes to sleep. Edwards pleads with his listeners to "take this opportunity to be born again." I cry to everyone who is outside of Christ, awake and flee from the wrath to come. The anger of Almighty God is undoubtedly hanging over many in this congregation. Let everyone fly out of Sodom: "Haste and escape for your lives, look not behind you, escape to the mountain, lest you be consumed." Jonathan Edwards' words are still relevant today. Nothing has changed because God never changes. Unfortunately, too many "Christians" do not know their Bible, and this kind of preaching sounds "mean, harsh, and intolerant." Why are soft, prosperity preachers, like Joel Osteen, so popular? Is it any wonder his congregation is the largest in the United States? I mean, really; how many people want to be reminded every week that they deserve to go to hell because they are not right with God? Someone actually spent the time and energy to create this really cheesy clip of Joel Osteen talking to Jonathan Edwards (who shares his theology straight from "Sinners in the Hands of an Angry God"). What a great list. I've read a number of them and need to read the rest. I agree with you. We need a good dose of Edwards today. Joel Olsteen aside, too many other churches present the Gospel as some kind of therapy program. I read the kiosks on some churches and they seem to read like they are advertising for a grief recovery program. I'm not saying that God is not our healer nor that our lives cannot be mended. But we forget how great and holy God is and that it is not about us but rather about worshiping God. I read something very interesting by John MacArthur. He quoted a Calvinist saying that too many pastors do not present the Gospel clearly enough or more people in their congregation would reject it. I think that's true. If people heard the real, unadulterated Gospel, there would be fewer people in church. That sounds harsh, even discouraging I know, but nevertheless I believe this is the true. Sadly, this is true. Too many watered down Christian churches are concerned with entertaining their congregations and keeping them content, it seems. : ( Surely, Edwards was speaking to the unsaved in his congregation. If one is saved, this kind of truth should not turn people away. Unfortunately, we are an entertainment-based society, and we really need the bells and whistles to keep us tuned in. Well put Ruth. I read this a long time ago. Probably due for a reread. Some great reading there, Ruth. 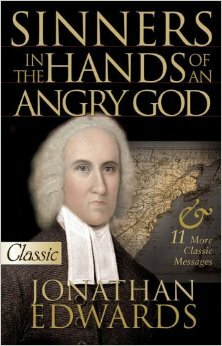 I haven't read Jonathan Edwards little book yet but I have it on the shelf. I recently bought the Simonetta Carr children's book on his life. She does a great job with introducing historical religious figures to younger people.